Squash House Quilts: April Fool's Day Giveaway Contest! I don't know about you, but I'm not one for playing tricks on others, nor do I much relish being tricked. So what better for April Fool's Day than a real giveaway contest - no fooling! Here is what I'm giving away. 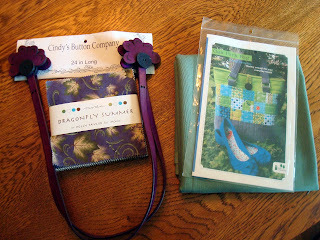 A charm pack of the newly released Dragonfly Summer by Holly Taylor for Moda, a pair of purple (no fooling) leather bag handles, a pattern for Stephanie's Oak Park bag, and more than enough coordinating green Osnaburg to use in the bag! Stephanie's pattern can easily be adjusted to use the leather handles. By the way, I might mention that Stephanie's Oak Park and Hailee bags will be in the May 16th issue of Connecting Threads catalog - kitted and ready to make! A little back story here...we recently had a very special visitor here at the Squash House! Her name is Catherine and she grew up in the house! 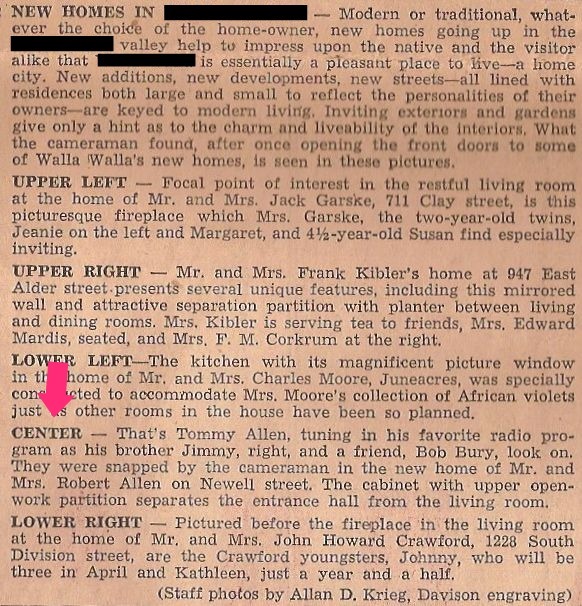 In fact, her parents had the house built, which in it's day was a "modern marvel". She had not been inside the house since she left some time ago. 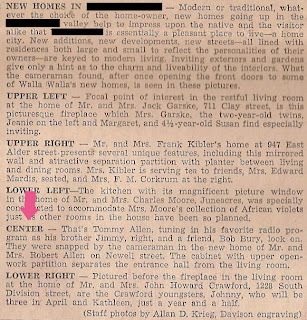 Catherine emailed me this article that appeared in the local paper right after the house was built. The picture above the article is actually a collage of three photos. A portion of the Squash House is in the middle - the man on the left and the picture of the fireplace are not part of our house. Below the picture is the article that ran along with the picture. I inserted an arrow where it talks about our house. Catherine explained to us that there were built-ins like this in several parts of the house but her mother got tired of dusting them and had them removed at some point! My kind of woman!! We thoroughly enjoyed our visit with Catherine and hope to see her again soon! 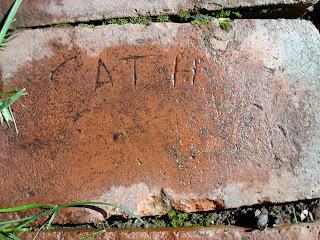 Anyway, last summer as we were working in the backyard I discovered a few of the bricks that line the garden had inscriptions in them! A little water and brushing away of moss revealed some names! This brick is one of Catherine's brothers. 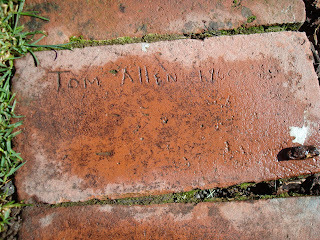 The house was built between 1948 and 1950, but this brick is dated 1960. 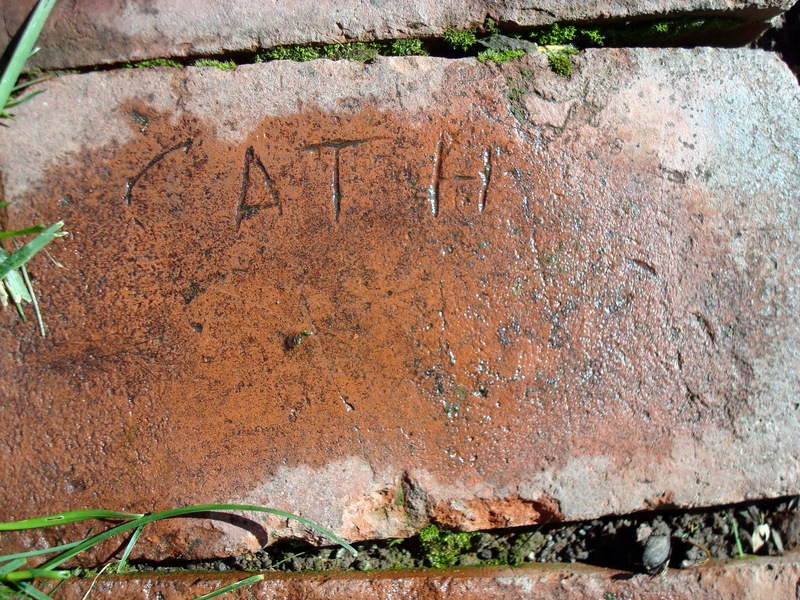 Here is Catherine's brick. I meant to ask her if she went by "Cath" in those days, or if she just didn't get as far as inscribing her full name! She did say she is much younger than her brothers, so maybe they helped her out! This brick puzzled us for the longest time! If you click on the photo you can see it better. It says "Fuzzy" Allen! Who was Fuzzy? A dog, a playmate with an unruly haircut, one of her brother's who had this nickname? Well --- none of the above! And so in lies the contest! Mr. Squash and I now know who Fuzzy was. There was actually Fuzzy and Wuzzy, but Wuzzy unfortunately didn't make it long in this world. I'll give you a hint. Fuzzy was an animal and was given to Catherine for Easter one year. Tell me who Fuzzy was and I will draw a winner among the correct answers. One guess per person, please! And you must leave me a way to contact you - either through your own blog or comment with an email address if you don't have a blog. I'll take comments through Monday, April 4th and post the winner on Tuesday, April 5th. Good luck! Fuzzy could be ... well any kind of animal. Children pick unusual names. I had an enormous "tom" cat fondly called Buttercup. And my niece has a beagle named Seagle. My guess is Fuzzy Allen was a floppy eared rabbit. I think Fuzzy was a dog. My guess is that Fuzzy was a kitten. Thanks for the fun. Your post was so interesting...really enjoyed it. I think Fuzzy & Wuzzy were Rabbits. 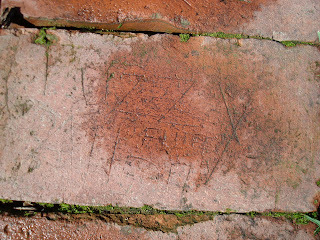 Oh Candace....though our cement stone at mom and dad's home isn't near as old it is always so fun to see our names scratched out in the cement when I visit. I'm really thinking a rabbit on this one. I think Fuzzy was the cat. I agree with most of the other comments that Fuzzy was a bunny. This old rhyme keeps coming to mind, "Fuzzy Wuzzy was a bear. Fuzzy Wuzzy had no hair! Fuzzy Wuzzy wasn't fuzzy, was he!!" LOL!! My guess would be a hamster. I would say a bunny. Great story, have a wonderful week-end! Hugs!! I'm guessing that Fuzzy & Wuzzy were baby Chicks, because when I was a child back in the sixties we received pastel colored baby chicks at Easter time. Then when their feathers started growing in we gave them to a Framer friend. I THINK THEY WERE RABBITS! My guess would be a baby chick. So sweet and fuzzy arriving just in time for Easter. I'm thinking baby chicks. That used to be pretty popular for an Easter pet. 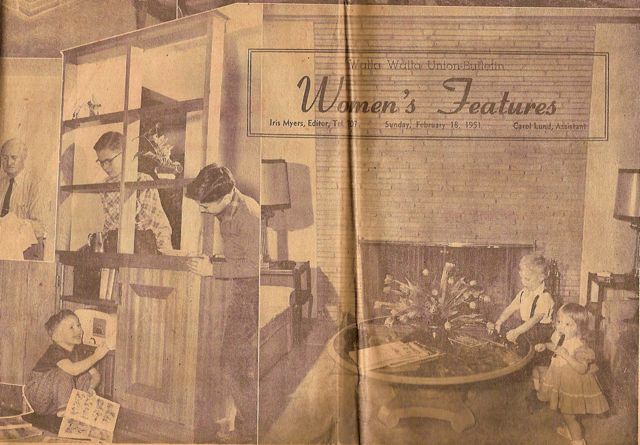 How fun to get a peak at past history of your place! That's just terrific. I think Fuzzy was a baby duck! I'm going to guess a hamster/gerbil? 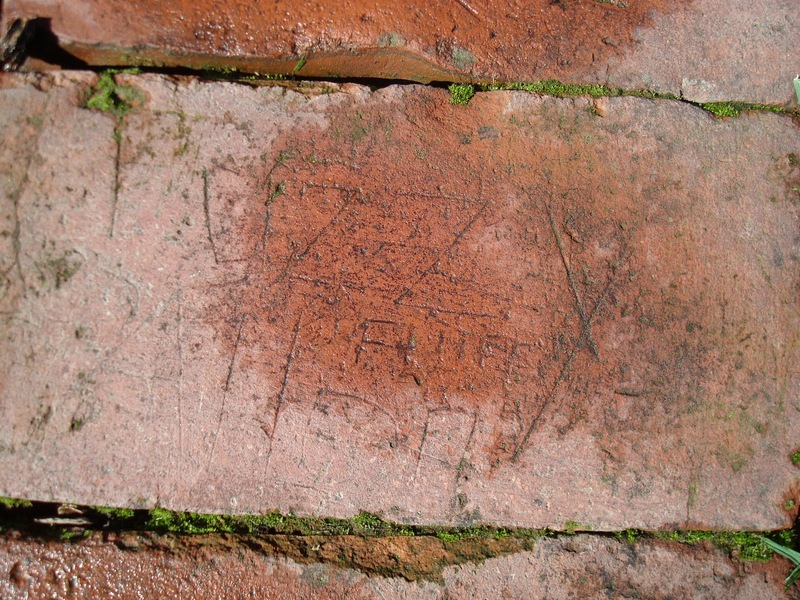 Love the story about your house and so happy to see that you left the bricks where they were. I'm sure Catherine enjoyed coming back to seeing her childhood home and she couldn't have better people to visit! Fuzzy Wuzzy was a bear, fuzzy wuzzy had no hair. Fuzzy wasn't fuzzy, was he? This brought back a memory from long ago. What a generous give-away. Thank you. I really like your blog. I'll guess Fuzzy was a chick...chicks and ducks were traditional easter gifts back then...my kids would have loved that! I have to agree with the masses...Fuzzy and Wuzzy were Easter rabbits. I love stories like the one you told today. Thanks for sharing. I think Fuzzy was a baby chick. Your story is straight out of "If Walls Could Talk" Love it! I absolutely LOVE this post Candace. How fun to meet someone from "back then". When Scott and I lived in Skiatook, OK...the same thing happened to us. The couple that once lived on the ten acres we lived on - IN A BARN (no kidding) showed up. They were SO scared to drive up our long driveway but you know me, no problem. Her Dad had won the same property (and house now turned barn) in a POKER GAME. They brought pictures for us and we talked for the afternoon...so much fun. I'm going with a rabbit :) Does the brick say "Fluff" under the word "Fuzzy" too? Fuzzy was a soft yellow baby chicken- not the usual peep we got on Easter. I am thinking fuzzy and wuzzy were soft baby chicks. Great story, it must have been interesting for her to see her old home again. - Because Wuzzy didn't live long I think they both were baby chickens. Since it was Easter, my first thought was chickens, but that seems unlikely, so I'm going to guess that they were rabbits. rabbits. I'm going to guess a chick. Growing up, they were the Easter Prize! I think Fuzzy was a darling Easter bunny. I would guess that Fuzzy was a bunny....so nice that you met Catherine and know more of your homes history. What a great story! I think Fuzzy was a bunny, but I guess he could have been a baby chick. Since Catherine got the animals at Easter, I think Fuzzy and Wuzzy were rabbits. 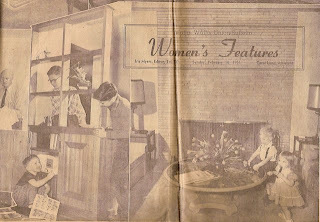 What a neat find & the article was fun to read. I believe that Catherine got 2 chicks for Easter. It was a popular gift back in the day. Fuzzy Wuz a Chick! Wuzzn't "she?" A Bunny! What a wonderful story, thanks for sharing.